CAIRO (AP) — The trial of Egypt’s ousted president and 14 others also accused of inciting the killing of protesters resumed on Saturday, Egypt’s official news agency reported. The agency’s report gave no details on the proceedings, held amid tight security in a makeshift courtroom in the national police academy in an eastern Cairo suburb. The trial is one of four the Islamist Mohammed Morsi and top leaders of his Muslim Brotherhood face. The charges levelled against them mostly carry the death penalty. Morsi was ousted by a popularly backed military coup on July 3. He is now held at a high security prison near the Mediterranean city of Alexandria. The charges against the defendants stem from violence outside the presidential palace in December 2012 when Morsi’s supporters attacked protesters staging a sit-in. The clashes killed at least 10 people. The defendants are charged with inciting the killing of three of those protesters. Morsi’s other trials are on charges of breaking from prison during the 18-day uprising against Hosni Mubarak’s rule in 2011, conspiracy with foreign militant groups and insulting the judiciary. Anti-Morsi protesters outside the police academy briefly surrounded the car of one of Morsi’s top defense lawyers, Islamist Mohammed Salim el-Awah, as it approached the police academy’s gate. Some pounded on the car while others yelled insults. El-Awah, a former presidential candidate, was unhurt. He later stepped out of the car to complain to a senior police officer, arguing that the protesters should not have been allowed so close to the gate. “This will have consequences,” he warned the officer before he returned to the car. Egypt has been rocked by a wave of deadly violence since Morsi’s ouster, with the army and security forces facing a full blown insurgency in the Sinai peninsula. The violence has spread to mainland Egypt, with attacks on high profile targets in Cairo growing more frequent. There also have been near daily protests by Morsi’s supporters, whose use of firearms against security forces is becoming more frequent. The military-backed government has meanwhile been cracking down on the Brotherhood and its allies, killing hundreds and jailing thousands since July. 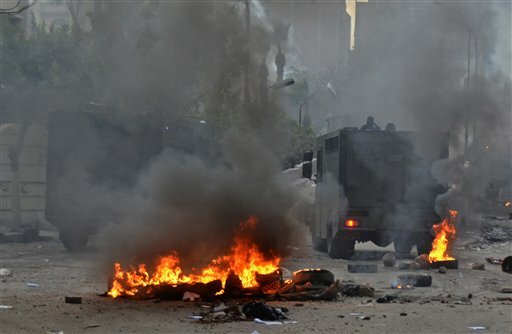 In the latest violence, the Health Ministry on Saturday said one person was killed in Cairo and 35 were wounded in clashes on the previous day between police and Morsi’s supporters in Cairo and several other cities. Also Saturday, a new Egyptian militant jihadi group issued its first statement, claiming responsibility for planting explosives and attacking security men and police stations. In a statement posted on a militant website late Friday, Ajnad Misr, or Egypt’s Soldiers, said it will fight the “regime’s criminal organs,” which it said were being used to humiliate the people and prevent them from performing religious duties. It said it planted and detonated two explosive devices on a main highway on Cairo’s outskirts Friday. Interior Ministry spokesman Hani Abdel-Latif said the explosion hit a vehicle carrying riot police and wounded an officer. Earlier this week, militant group Ansar Beit al-Maqdis confirmed that Ajnad Misr was responsible for the Jan. 24 bomb attack that targeted Cairo’s Talbiya police station, which police said caused no casualties. Associated Press reporter Maamoun Youssef contributed to this report from Cairo.